In 2014, a Princeton University study predicted that Facebook would lose 80% of its users by 2017. But instead of declining, Facebook’s user base has steadily grown to more than 2 billion, making it the largest social app in existence. There goes their tenure. As we begin 2018, the reach of Facebook remains staggeringly huge. When you drill down to the fashion and beauty vertical, the numbers are no less compelling. According to a FacebookIQ survey, 40% of Facebook users say they’ve discovered fashion inspiration on the platform in the last three months, and three out of five people admit to having been tempted to buy a fashion item they didn’t intend to buy. Our recent Shopper Story report backed this up, with 70% of respondents saying they frequently or sometimes make an impulse apparel purchase online. When it comes to Facebook and Gen Z, our recently released Gen Z report shows that though many younger Gen Zers (around 16 years old) are active on newer platforms like Snapchat, older Gen Zers (closer to 24 years old) still use Facebook a lot too. Fifty-five percent of respondents said they use Facebook several times a day. It’s no secret that video is tops for engagement. You can add another layer of interest by going live. Facebook live videos are a great tool for capturing behind the scenes action at fashion shows, a celebrity interview, or a Q&A session with a beauty guru. Check out this Glossier live video example. If you’re planning a video shoot, consider including shoppable (also called interactive or ecommerce) technology. This allows viewers to click prompts on the screen to save items for viewing later or to head straight to a link to buy the item. Kate Spade’s holiday video from last year is a fun example. 3. Make friends with influencers. According to FacebookIQ, 52% of beauty shoppers say that they are influenced by beauty experts on social media. That’s why, no matter the size or cachet of a brand, connecting with other fashion and beauty influencers is always a smart play. The benefits of making these connections include exposure to influencers’ large followings, and new sources of content to tap into. 4. Engage with fan groups and other beauty and/or fashion-themed groups. If you have a fan group (or several!) on Facebook, give them some time and attention. Show those most loyal to you that you care, and you’ll reap the rewards in return in the form of repeat purchases from loyalists and word-of-mouth referrals. Same goes for more general fashion groups – find one or two that are best suited to your brand and join the conversation every now and then. 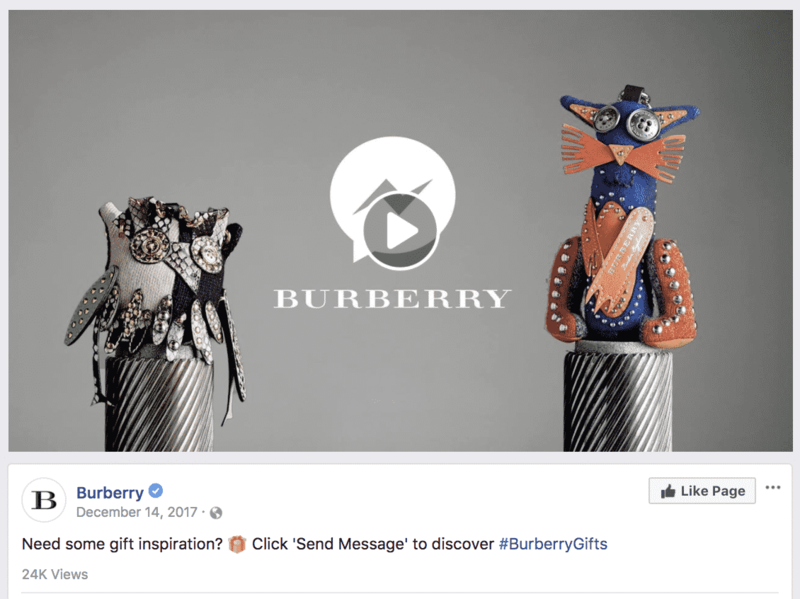 Through Messenger, you can launch a chatbot to handle a variety of tasks, like answering customer service-type questions, or providing personalized beauty tips or outfit selections, like Burberry’s gift finder service. Some more interesting chatbot applications include virtual try-ons, lipstick shade finder, personalized skin care regimens, and booking in-store appointments. 6. Run Facebook dynamic ads. If someone abandoned a shopping cart on your site, there’s a very good chance you can reconnect with them on Facebook at some point in the near future (remember that 2+ billion users stat?). Dynamic retargeting ads marry purchase intent with individual personalization to create ads that deliver impressive ROI. Advertisers that have used Criteo’s solution for Facebook dynamic ads see about a 16% sales uplift on average. By employing one or more of these strategies, you can make 2018 the year you turned your Facebook page into a bona fide sales machine.